A 17-year student was suspended from her school in Houston, Texas, on Monday for not standing for the pledge of allegiance. Now, her family is suing the school district and the principal for violating her First Amendment rights. India Landry was in the principal's office at Windfern High School and refused to stand when the pledge of allegiance was played on the school intercom. "The other woman said this isn't the NFL, you won't do this here," Landry told The New York Daily News. Her attorney Randall Kallinen, who specializes in civil rights cases, reportedly filed a lawsuit against the Cypress-Fairbanks Independent School District and Landry's high school principal on Saturday. "Students cannot be instantly expelled except for being a danger," he said, as cited by The New York Daily News. "The only danger appeared to be that her sitting whipped Principal Strother into a political frenzy." Landry claims she hasn't stood for the pledge in months as a form of peaceful, silent protest. The AP reports that Principal Martha Strother reversed her decision Friday and allowed Landry to return to school, however, her family will likely proceed with the case. 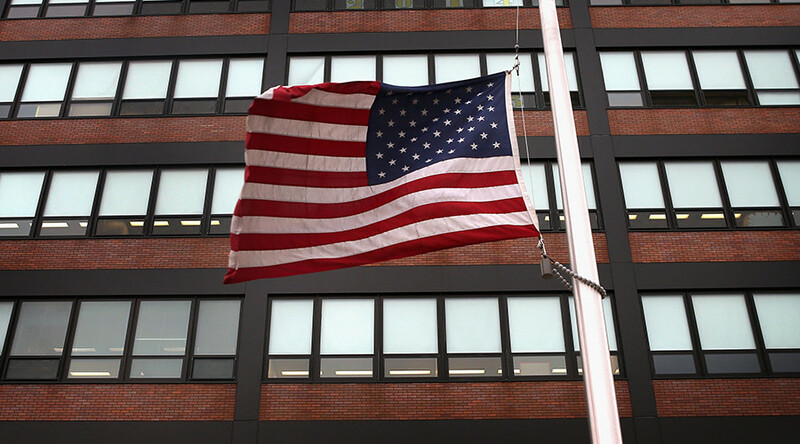 “A student will not be removed from campus for refusing to stand for the pledge,” said Nicole Ray, a spokeswoman for the school district, the New York Daily News reported. However, according to a 1943 court case: "the action of the local authorities in compelling the flag salute and pledge transcends constitutional limitations on their power and invades the sphere of intellect and spirit which it is the purpose of the First Amendment to our Constitution to reserve from all official control." In other words, the government cannot compel students to participate in the pledge as this would violate their constitutional rights.